As a person who lives a gluten-free lifestyle out of necessity, let me tell you that I faced a few challenges in the beginning. I only learned that I was gluten-intolerant a couple of years ago and I had to take a serious look at my stockpile. Anything with grains had to go. That includes flour and anything that has flour in it; breads, gravies, many commercial seasoning mixes, pasta; it seemed my stockpile diminished to practically nothing. I didn’t discard it because my family can still eat all of that but I needed to take a serious look in order to ensure that I have enough stockpiled for myself as well. Most gluten-free commercial foods are expensive but I’ve found ways around it in my everyday life. In my prepping closet, though, I’ve made a few adjustments. There are many different flours that you can store in place of wheat flour. Unfortunately, most of those flours have a bit of a shorter shelf life than wheat flour and they’re different to cook with. I have several different recipes that I use depending on whether I’m baking bread, cookies, cakes or cornbread. I suggest stocking the basic flours: almond, tapioca, cornmeal, rice flour, potato starch and maybe a bean flour. For thickening, I keep cornstarch for milk-based products and arrowroot powder for non-dairy recipes because dairy tends to make arrowroot a bit slimy. Usually I just use cornstarch. It’s cheap and easy to store because a little bit goes a long way. I also have bulk storage of oats (not quick cook) because it’s good to eat, it works as a binder in many recipes and it’s even good for your skin. Also, oat flour is great for many recipes including pancakes. One of the first restrictions that I really felt was the absence of pasta. I was never much of a bread or cake eater, but I did love pasta. Back even a couple of years ago, there weren’t many gluten-free pasta options, at least not ones that tasted decent. Instead, I stocked bulk rice. Over the last year or so, the major brands have developed pasta that tastes extremely similar to wheat pasta, due to the increase in gluten intolerance (don’t even get me started on my suspicions behind the cause of THAT!). At any rate, I have now stockpiled gluten-free pasta in place of regular pasta – my family eats it and likes it, so there’s no need to store anything other than gluten-free pasta. In recent months, it’s come to light that the fermentation process involved with creating sourdough bread breaks the gluten strands down to the point that it’s tolerable to Celiacs and people with gluten intolerance. The jury is still out for some people but I can eat it with no problems. For that reason, I keep a sourdough starter on hand so that I can make it whenever I want to. If you like to have the occasional cocktail, beer is off the menu. That’s about it, though. Wine, ciders and nearly all distilled alcohols are gluten-free. As a matter of fact, I have yet to find a distilled alcohol that has gluten in it. Feel free to stock your favorite beverage as long as it isn’t beer or malt beverages. For quick, light foods, I’ve made my own granola bars and vacuum sealed them so that I have a good source of nutrition already in my bug-out bag, ready to go. Trail mix is another nutrient-dense food that I’ve added to my stockpile – just be sure to read the label if you’re buying commercial mix. Chex cereals are all gluten-free except for wheat checks so you can stockpile that as part of your trail mix if you want. Once I started paying attention to what foods had gluten, I was surprised to learn that it was found in many different foods. Perhaps I should explain exactly what gluten is, so that it will be easier to understand why it’s added to other foods. Gluten is the protein found in wheat. It’s what gives dough its elasticity and helps to hold the dough together as it bakes into bread, cake, etc. Extra gluten is often added to cake and pastry flours to make the product lighter and fluffier. Gluten is also added to many commercial spices and seasonings to keep it from clumping together. But wait – I’m not done yet. Gluten is also used as a thickener and a binder to keep ingredients from separating. Ketchup is a good example of this. Oh, and soy sauce is off limits, too. The first ingredient is usually wheat. Well, at least we still have ice cream. Or not. Flour is often used in ice cream recipes as a thickener so check your labels before buying your favorite chocolate chunk or butter pecan. Other foods that you need to watch out for include cereals, condiment, French fries, chicken wings and even non-edible stuff such as cosmetics including lip gloss and toothpaste. The one thing that I did learn through this experience is that all of the foods that are actually good for me – fruits, veggies, meats, eggs, milk, etc. – are all still perfectly open to me. The substitutions that I’ve had to make were all good ones. Even when I use a substitute flour, it’s a nut flour and still better for me than nutrient-poor white flour. As soon as I got the hang of it and learned to start checking labels, stockpiling gluten free foods became a piece of gluten-free cake! The bottom line of it is that stockpiling gluten free is actually a healthy choice regardless of whether you have a gluten problem or not. It pretty much eliminates foods that you eat on a regular basis that are bad for you. For the first six months, I lived on fruit, veggies and meat because I didn’t understand how many foods had gluten in them. I felt cheated when everybody else was eating pizza or pasta but now I’m used to it and healthier for it! If you have anything to add about gluten free stockpiling or any questions that you’d like me to answer, please speak up in the comment section below. 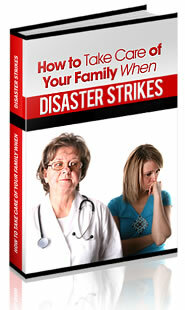 Interested in preparing for any type of disaster? CLICK HERE to earn how!